Get an up-close look at the coding vendor negotiation process from both sides of the fence. 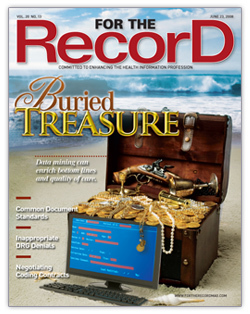 For various reasons, coding vendors often help facilities alleviate a backlog of uncoded medical records. To ensure a more successful vendor experience, healthcare organizations must consider several things when negotiating a contract. Conversely, vendors should maintain a solid approach when dealing with facilities, and coders need to be flexible and motivated. One reason a facility may contract with a coding vendor is long-term coder vacancies, says Beth Friedman, RHIT, director of marketing at the Friedman Marketing Group in Lynchburg, Va. She defines a long-term vacancy as “one or more positions open for three or more months.” A vendor may also be needed when there is an abnormal increase in discharged not final billed (DNFB) records, a situation that occurs when patients have been released but the records have not yet been coded or billed. Additionally, vendors may be needed when regular coders are out for numerous reasons, including vacation, illness, or maternity leave. Finally, hospitals situated in tourist destinations may experience seasonal spikes in their population, resulting in more hospital visits, which in turn cause coding backlogs. A facility may also enlist the aid of a vendor if it has difficulty recruiting and retaining qualified coders or if there is a persistent staff shortage, which often occurs in states that do not have any type of accredited coder program. Such circumstances can prompt the search for skilled candidates and begin the process of vendor contract negotiations, says Lou Ann Wiedemann, MS, RHIA, manager of professional practice resources at the AHIMA, who adds that backlogs can also happen with new requirements, such as when Medicare severity diagnosis-related groups (MS-DRGs) were implemented in 2007. Implementing MS-DRGs also changed the complication-and-comorbidity (CC) condition capture rates. Changes such as these often require a coder to scrutinize the record a little more closely and can result in a learning curve in which coder productivity can decrease as the coder learns the new system. In addition, 2007 brought present on admission (POA) indicators into the coding process. Correctly coding POAs requires coders to determine that the patient’s diagnosis or diagnoses was present on admission. “It would appear that present on admission would be relatively easy to determine, but what we are finding is that is not always the case. MS-DRGs, POA, MCC [major CC], and CC all hinge on physician documentation. It goes back to good clinical documentation and whether or not the coder has everything they need in that record to code it accurately and timely,” says Wiedemann. Healthcare organizations should focus on certified and experienced coders when searching for a coding vendor, according to Yvonne D. Dailey, CPC, founder of Dailey Billing Services in Toms River, N.J. New coders are simply not ready to be on their own, she says. “Experience is key because you can get certified today and still not have enough experience to code for a facility unsupervised,” Dailey says. “They [coders] need a good two years’ experience if they wish to venture out on their own.” After completing course requirements, coders are tested on full knowledge, but everything is geared for various specialties using different terminology, procedures, and carrier policies, she says. “How I code for a cardiologist is not going to be the same thing as for a dermatologist,” Dailey adds. Besides certification and experience, coders should have professional liability insurance, says Friedman. Additionally, if coders are traveling and going on site, they may want some type of workman’s compensation or personal injury insurance since the hospital probably won’t pay for on-site injuries, she says. Additionally, says Dailey, a HIPAA agreement outlining confidentiality should be included in vendor contract negotiations. She also suggests that coders employed by vendors should have a business associate agreement. Contract language is important and, at a minimum, should include the work to be performed and the rate of pay, says Friedman. Rates for each chart type, including inpatient, emergency department, outpatient, and clinic, should be clearly stated in the contract. Taking it a step further, she says vendors may want to request higher rates on inpatient charts with a long length of stay. “Be specific in describing the work to be performed. You might get reimbursed so much money for an inpatient chart to be coded, but don’t leave it open-ended because certainly a patient who only stays five days is easier to code than a patient who stays 20. It’s going to take you a lot longer to code that long stay,” says Friedman. Criteria for judging performance is another aspect of the arrangement that should be documented. “The important thing is to know what they [vendors] will be measured by—the metrics,” says Friedman, who adds that vendors should know how productivity and quality will be measured and then how it ties to their pay. “I think it is real important to have that spelled out,” she says. Additionally, a vendor should know how long the job is expected to take before accepting an offer. Facilities that use a vendor one day and not the next can pose cash flow problems for vendors who work independently. “They need to set up their contract for a minimum of a six-month engagement and longer if they can get it. Long-term agreements and long-term contracts are a win-win for everybody because the coder will get to know the client’s systems, workflow, charts, doctors, and the types of patients they treat. The hospital will come to rely on and develop a relationship with that person, so the longer the contract, the better,” says Friedman. There are several items to consider when selecting a vendor, says Wiedemann. First, determine the volume of records that needs to be outsourced. For example, if a facility chooses to outsource 100 emergency department records per day, it has to be certain the vendor can keep up with that volume. Next, the facility should know what types of records it wants to outsource. For example, does it want to focus solely on inpatient records? Or will it be providing the vendor with a mix of patient records? Wiedemann says the facility also needs to decide if it wants to scan the records or have the vendor come on site. Besides determining the volume of work to be completed, the job scope must also be considered. Do you want vendors to just strictly code? Some facilities abstract their medical records for specific information such as drug interactions or other criteria coders must look for, says Wiedemann. “When you outsource, you need to know whether you want that company to do that also or whether you are going to try to do that in-house,” she says. Finally, Wiedemann says the facility must take into account internal issues and ask what it wants to accomplish by outsourcing its medical records. She suggests a few questions that facilities should ask themselves when considering a vendor: Are you looking for a long-term relationship or a commitment from a vendor that works only on an as-needed basis? Are you looking for a stable relationship (eg, somebody you can count on to be there every day, just weekends, or just coverage for a leave of absence)? What are the credentials of the contract coder? Do they meet the organization’s own coder requirements? • How will the vendor get the information? • Will the facility be required to scan or mail records off site? • If scanning is required, who provides the scanning equipment? Whose staff perform the scanning function? • How will the information be transmitted back and forth between the contract coder and the organization? By fax, mail, or scanning? • Will the vendor require remote access to the organization’s system? What privacy and security issues will result? • Will the IT department permit remote access by contract workers? Conversely, there are also issues to address when vendors are working on site, says Wiedemann. For example, does the facility have to pay vendor travel costs and/or a per diem? Occasionally, vendors will charge less per record if the coding is performed on site. However, by the time the hospital pays the vendor’s airfare, hotel costs, and per diem, it may end up costing more than contracting to do it remotely, she says. Besides determining specific coding needs, Wiedemann says facilities also have to ask how they are going to pay for contracted services. Pricing guidelines vary for inpatient and outpatient records. For example, inpatient charts are paid at one fee, while emergency department charts are paid at a different rate and may be less expensive. Additionally, outpatient or clinic records may also be less expensive to code. Another option is to pay vendors by the hour. However, facilities that choose this option need to know how many records the vendor can code in that time frame, says Wiedemann. “If you expect them to produce 25 records in an eight-hour time period and they only produce 10, then you may have an issue,” she says. • How does the vendor plan to perform quality checks? Who will be performing the quality checks? • What steps need to be taken to ensure records are coded accurately? How will the facility make sure patient records have been coded correctly using internal guidelines? There are several qualities coders need to make the successful transition to working for a vendor. For example, they should be able to work independently and make independent decisions, says Friedman. “They will be doing the same work they always do, but if they are working for an outsourced coding company, there is a high probability they will have to travel, so being flexible and adapting to change easily is important,” she notes. Additionally, she says being able to handle unexpected problems, especially while traveling, is a handy trait. Dailey notes other essential qualities such as a strong motivation to find work and a designated work space for those who toil at home. A willingness to learn is essential. Coding changes every day, and coders must be able to network so they can meet people in the industry and have that “go to” if they get stuck or have a question, she says. For vendors to stay on top of the profession, Friedman suggests developing and maintaining a Web site. After landing the first contract, ask the (hopefully) satisfied facility for a testimonial or reference that can be displayed on the site. She even forecasts a day when an auctionlike site is created where independent coding consultants and vendors can go to bid on available coding jobs. Additionally, printing business cards and networking are also good ways to attract business, Friedman says. Finally, attend local, regional, and state AHIMA meetings and take advantage of the resources they provide.